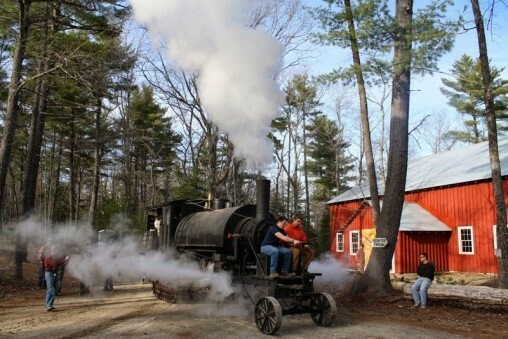 One of the very first steam runs in April 2014. The steam Lombard log hauler is important as the first successful tracked vehicle and was patented in 1901 by Alvin Lombard of Waterville, Maine. These Maine built machines led the way for all modern tracked vehicles. The 19 ton steam Lombard initially burned wood and traveled on iced roads at about 5 miles per hour. It towed multiple sleds of logs with loads up to 300 tons. They replaced the work of about 50 horses. Lombard built 83 of these steam powered log haulers in his Waterville factory before switching to gasoline power. Only 6 steam Lombard log haulers are known to remain, with 3 in operating condition. Lombard licensed his patent to the Phoenix Company in Eau Claire, Wisconsin which built additional Phoenix steam log haulers. Very few of these historic machines are left.